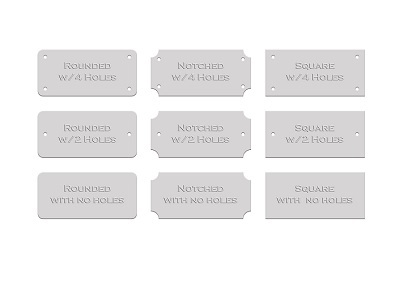 These solid aluminum plates are designed for machine or hand engraving (even painting) and can be used for a variety of purposes from nameplates to desk or door plates to plaques and awards. Other uses are dog tags, jewelry, and artwork. The material is rigid but can be bent by force and pliable enough to bend slightly without distorting. These are made from high quality aluminum designed for engraving and will have a finish that uniform and smooth. Material Thickness; aluminum is .70mm / .027"